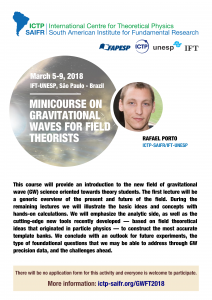 This course will provide an introduction to the new field of gravitational wave (GW) science oriented towards theory students.The first lecture will be a generic overview of the present and future of the field. 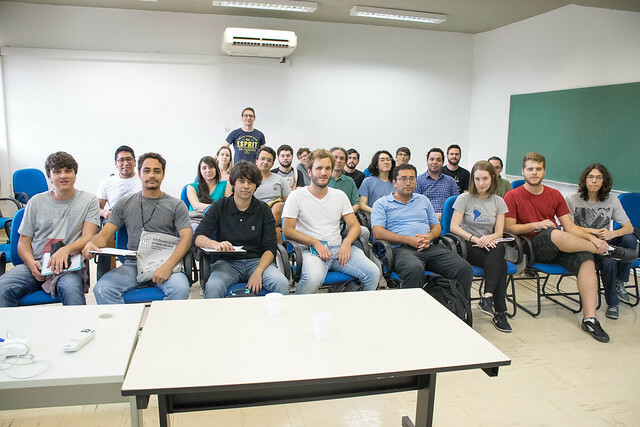 During the remaining lectures we will illustrate the basic ideas and concepts with hands-on calculations. We will emphasize the analytic side, as well as the cutting-edge new tools recently developed—based on field theoretical ideas that originated in particle physics—to construct the most accurate template banks. We conclude with an outlook for future experiments, the type of foundational questions that we may be able to address through GW precision data, and the challenges ahead. On Monday, at 10 am in the IFT-Auditorium (4th floor), Odylio Aguiar (INPE) will give the lecture “Ondas Gravitacionais: Prêmio Nobel de 2017 e uma nova janela para o Universo”. There will be no application form for this activity and everyone is welcome to participate. For more information, send email to secretary@ictp-saifr.org .